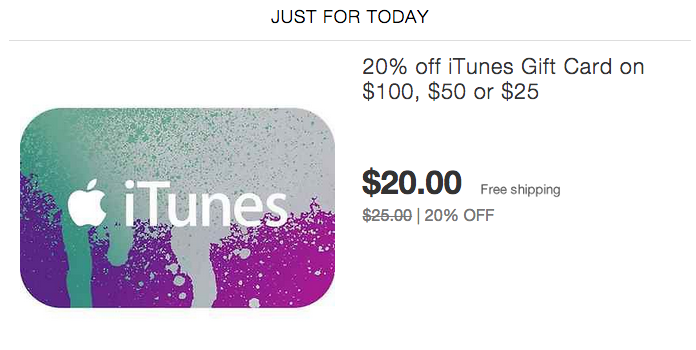 PayPal’s official Digital Gifts eBay storefront is offering 20% off a variety of iTunes gift cards: $100 for $80, $50 for $40, and $25 for $20. Unlike previous iTunes deals, PayPal will email your gift card so you’ll be able to use it within hours. Each gift card can be redeemed towards any media (apps, games, music, movies, books, etc) from Apple’s App, iTunes, iBook, and Mac App Store. This is a great opportunity to save on top movies or apps that are rarely discounted like Apple’s Final Cut Pro. Even better, purchase apps/games that are already on sale to double up on your savings. PayPal Digital Gifts is your one-stop store for digital gift card shopping. To buy a gift card, simply browse our selection and choose the perfect one to be delivered today or in the future.